Pick Analysis: The Delaware Gatorade High School Player of the Year in 2013 (state-record 18 touchdowns as a senior, 15 career return touchdowns) has helped Penn State make national headlines for the right reasons over the past three years. Rod Christopher Godwin contributed immediately for the Nittany Lions, starting three games (25-321, two TDs). He had a breakout sophomore season, earning third-team All-Big Ten honors with 69 catches for 1,101 yards and five scores. Though some of his receiving numbers were down in an honorable mention all-conference junior year (59-982), Godwin scored a career-high 11 times. He saved the best performances in his career for bowl games, first as a freshman (7-140, TD vs. Boston College in Pinstripe Bowl), then in 2015 (6-133 vs. Georgia in TaxSlayer.com Bowl) and finally in his last college game (9-187, 2 TDs vs. USC in the Rose Bowl). 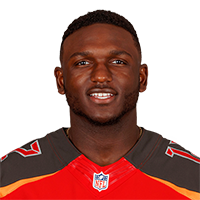 Published: April 28, 2017 at 10:44 p.m.
Former Buccaneers Super Bowl champion Ryan Nece announces the Tampa Bay Buccaneers' selection of Penn State wide receiver Chris Godwin in Round 3 with the No. 84 overall pick in the 2017 NFL Draft. Published: April 4, 2017 at 04:51 p.m.
Penn State wide receiver Chris Godwin goes through drills at the 2017 NFL Scouting Combine.